Classic Birthday Party games for kids. Many of these we may remember playing when we were young. You can add variations to match the theme of your party. Here is a list of the birthday party games on this page and a link to quickly jump to it. This classic party game Pin the Tail on the Donkey can be changed to accommodate your party's theme or holiday. There are premade games you can purchase from any party supply store or store with a party section such as WalMart. You could use a poster or if you are artistically inclined, even draw one. Tape the picture or poster low enough for the youngest child to reach on wall or stand up easel. Mark where to start from. Assist child in placing bandanna, blindfold or hat on their head. Place tail or token in their hand ready to place on poster. Spin slowly in a circle a couple times for older children. Guide them in the direction of the poster. Child closest to the designated target is the winner or for young children, give each a small prize for trying. Be sure that the path is clear of objects when child is walking, no tables, sharp corners, rugs to trip on. Young children may not want to wear the blind fold, they just enjoy sticking it on the poster. For very young toddlers spin slowly, or not at all. 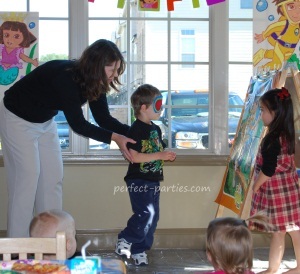 Pinata's are wonderful birthday party games. 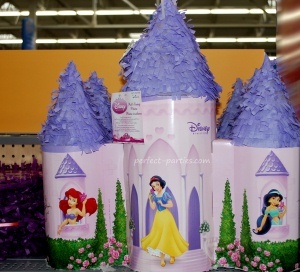 Children love the challenge of hitting a pinata and waiting for the treats to fall...fill with small candies, snacks or small toys. Tree or somewhere to hang Pinata. Hang low enough for the youngest child to hit. Designate an area for children to wait there turn safely. Place stick in child's hand and blindfold. Guide them if necessary to the pinata. Allow one or two swings so each child has a turn. Be sure to have a safe area for children to wait their turn. Have rules for collecting the candies when they start to fall so they don't just rush in while someone is still swinging and also so that each child gets some. This birthday party game is great for all ages. Fill brown paper bags or shoeboxes with various items and have children guess what it is. The winner is the one with the greatest number of items identified. Wrapping Paper to cover boxes. Decorate small shoe boxes with matching theme wrapping paper or stickers. Cut a small hole in the top of the lid of a shoe box, just enough for a hand to fit comfortably. Tape down the lids of the shoeboxes. You could add food such as grapes but remember children may squeeze the items! Boxes will hold up much better than a bag. But if you don't have enough shoe boxes, double line lunch bags. Tempera paint doesn't adhere well to shoe boxes with the shiny coating. Classic kids birthday party game that will bring many laughs! Use entertaining music to make it interesting and decorations on chairs to make it festive. Substitute pillows for chairs for younger toddlers. Use fun music that sound like animals and have children walk around like elephants, or monkeys or marching music to march. Have enough chairs for all but one child. Example: If there are 10 children, you need 9 chairs. Place chairs in the room so they are arranged either back to back in a line or in a small circle with seat facing out. Have the children to form a larger circle around the chairs. Instruct children to walk or march around the chairs until the music stops. When the music stops, the children will sit in the chairs as fast as they can. The child who is without a chair is "out" of the game. Repeat until you have one child left who is the winner. Depending on age you may want to limit number of children per game and length of music being played accordingly. Number squares of cardboard with marker or print out numbers and affix to square. Make one per child. Arrange in a circle or oval. Write or print numbers on small pieces of paper corresponding with the number of squares. Have each child stand on a square. Instruct children to walk or march in order until the music stops. When the music stops, the children will freeze on the closest numbered square. Pick a number from the bowl. The child standing on that number wins a small prize. Continue until each child has won a prize. For young children, make large numbers for children to match to the square they are stepping on. These are great birthday party games for filling in time and waiting to transition to the next part of your party. They are easy and require no props to set up. Choose someone to be Simon. Simon gives commands. When someone follows a command that does not begin with "Simon says..., he or she is out out the game. Simon continues giving commands until there is only one person left. This person becomes Simon if you continue with a second round. Have 7 people stand in front of the group. Have the rest sit down. One person in the front say, "Heads down, thumbs up" When each of the original seven have touched one person's thumb, they stand in front again, and someone says "Heads up Seven Up". Each "tagged" player has to guess who tagged them out of the original seven people. If they get it right, they become one of the seven people, so basically they switch spots. If they get it wrong, these people stay where they are. This is a great classroom or birthday party game when you need a few minutes before the next activity. One person is the "Spy" and says, "I spy with my little eye something that begins with the letter "__". The other children try to guess what it is. The child who guesses correctly gets to by then next "Spy". Eaxy class or birthday party game. Children sit in a circle. Choose a person to walk around the outside of the circle. As they walk they tap each head gently and say, "Duck..." On one child's head say, "Goose." That child gets up and chases the person tapping heads. If they catch them by tagging, then that person remains the tapper. If that person runs around the circle and sits where the "goose" was without getting caught, the goose becomes the next tapper.